Nahuel Ignacio Guzmán (American Spanish: [naˈwel ɣuzˈman];[a] born 10 February 1986), nicknamed Patón ([paˈton]; Spanish for large-footed) is an Argentine professional footballer who plays as goalkeeper for Tigres UANL and Argentina. Guzman made his professional debut for Newell's Old Boys in August 2006 against C.A. Belgrano. On 2008, he went on loan to Independiente Rivadavia until 2009. He became a key to the championship of Newell's in the 2013 Final Tournament. On July 2014, he was transferred to Liga MX club Tigres UANL to play the Apertura 2014 season. 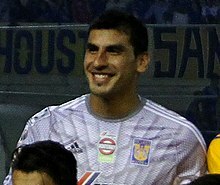 Guzmán made his official debut with Tigres in a 0–0 draw against Atlas de Guadalajara at the Estadio Jalisco on 19 July. That season, Guzmán and his club made it to the finals of Liga MX against Club América. In the home leg, Tigres won by 1–0 with goal of Joffre Guerrón. In the second leg, Guzmán received a red card, as did teammates Hernán Burbano and Damián Ariel Álvarez. Tigres lost 3–0, in an overall score of 3–1. Tigres reached to the finals of the Copa Libertadores 2015 against River Plate. After a 0–0 draw in the home leg, Tigres lost the second leg by 3–0 in Buenos Aires. In December 2015, Guzmán and his team became champions of the Apertura 2015 season. In the first leg of the finals against Pumas UNAM, Tigres won by 3–0. In the second leg, Pumas won by 3–0. In extra time Tigres scored the 1–3 at 103' but Pumas equalized 1–4 at 119'. After an aggregate of 4–4, Tigres won via penalty shoot-out 4–2, with Guzmán stopping the fourth shot from Pumas. A year later, Guzmán and his team faced América to become champions for the fifth time. In the first and second leg the teams tied 1–1. After an aggregate of 2–2, Tigres won via penalty shoot-out by 3–0, with Guzmán stopping all 3 penalties. Guzmán was named MVP of the second leg and named best goalkeeper of the Apertura 2016, with 9 clean sheets and impressive saves against América in the finals. Guzmán was an integral part of the Argentina U-17 side in the World Cup of the category 2003. On 13 October 2014, he played 45 minutes with Argentina in the 7–0 victory against Hong Kong in a friendly match. In May 2018 he was named in Argentina's preliminary 35-man squad for the 2018 World Cup in Russia. Guzmán was called up to the final 23-man squad after first-choice keeper Sergio Romero was ruled out through injury. Statistics accurate as of match played 16 June 2018. ^ In isolation, Guzmán is pronounced [ɡuzˈman]. ^ "America crowned as Tigres see red cards". fifa.com. Retrieved 30 December 2014. ^ "Three players sent off in NINE MINUTES as Mexican league final turns sour". dailymail.co.uk. Retrieved 30 December 2014. ^ "Argentina thrashing of Hong Kong". reuters.com. Retrieved 21 November 2014. ^ "Argentina and Man United goalkeeper Sergio Romero to miss World Cup with injury". ESPN.com. 22 May 2018. ^ "Nahuel Guzmán". National Football Teams. Benjamin Strack-Zimmerman. Retrieved 21 June 2018.